Consumers are increasingly engaging with in-app environments, but advertisers still have reservations about the format. Has ad spend followed consumer behavior, or have quality concerns deterred advertisers from this potentially lucrative advertising environment? And what can publishers and ad tech providers do to help advertisers achieve their in-app goals and reap the benefits of in-app opportunities? To answer these questions, PubMatic commissioned Forrester Consulting to interview over 300 advertisers, agencies and technology providers across the US, Europe and APAC. 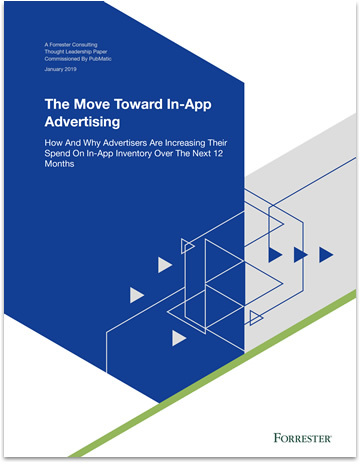 The study, “The Move Toward In-App Advertising” delves into how media buying organizations plan and purchase programmatic in-app advertising and how publishers and tech providers can capitalize on the growing investment in the format. Media dollars are increasingly being spent on mobile in-app environments, with 90 percent of media buyers planning to increase investment in programmatic direct in-app advertising over the next 12 months. Ad fraud and measurement issues plague advertisers, leaving them looking to publishers and technology partners for assistance with fraud and viewability verification. Advertisers enjoy the enhanced targeting and increased customer engagement that in-app provides, as nearly three-quarters of respondents identified targeting as the most important criteria for choosing an in-app publisher. Discover additional insights and recommendations by downloading the full study today.